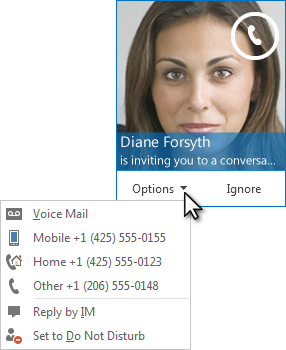 You can use Lync to call your contacts, or dial a number just like a regular phone. 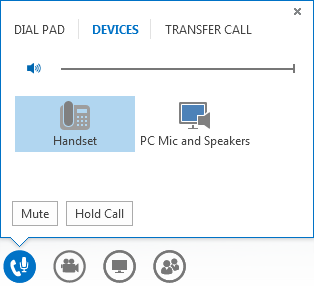 Then you can mute, unmute, transfer the call or use the in-call dial pad to interact with automated audio systems. All you need is your computer speakers and microphone, or a headset connected to your computer. Take a look at these devices that work great with Lync, and don’t forget to set up your audio device before making a call. Point to the contact’s picture. 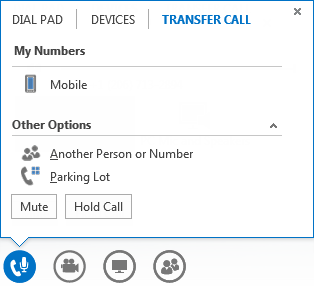 In the Lync main window, click the Phone tab. Click the numbers on the dial pad or type the number in the search box, and then click Call. Important: Lync doesn’t support pauses, extension numbers, or special access codes. Use the keypad to enter the extension number or access code once the call is connected. 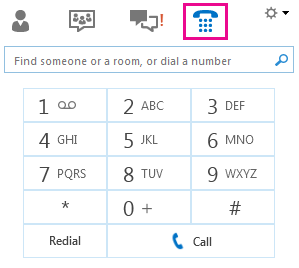 When you’re finished with the call, click the Phone button in the window, or just close the window. To answer the call, click anywhere in the picture area. When you’re ready to speak, click the phone/icon again to unmute. You can transfer a call to another person or number. For example, if you need someone else to handle the call, you can transfer to them. Or if you need to leave your office, but want to continue your conversation, you can transfer the call to your cell phone. To put the call on hold, click HoldCall. To change your audio device, click the DEVICES tab. Use the DIAL PAD to interact with an automated phone system. Such as entering a code, when you call your voicemail, or make a selection when you call an office reception desk. Click the DIAL PAD tab and then click a number.